If you need to start speaking German Fast, but you don’t have a lot of time to study the language, German For Dummies Audio Set is the quick-learning solution for you. These three sixty-minute CDs feature fast, focused instruction that gets you quickly up to speed on essential vocabulary and language structure. Heading for Germany, Austria, Switzerland, or any other German speaking country? 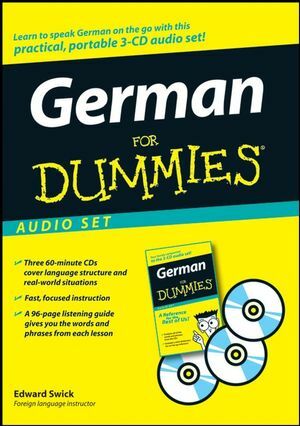 German For Dummies Audio Set is packed with all of the must-have expressions and phrases, you need to conduct business or have a great vacation! Edward Swick (Chicago, IL) has been a foreign language teacher for more than 30 years. After studying at the University of Hamburg in Germany as a Fulbright scholar, he completed his Master's Degree in German, Russian, and English at Southern Illinois University. He now resides in Chicago, where he works full time on German and ESL instructional materials.